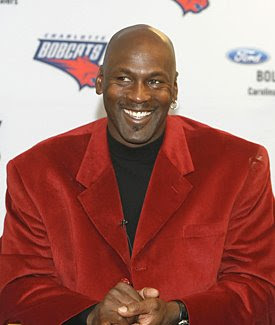 Michael Jordan turns 46 years old today. He's no longer turning heads on the basketball court, but spends much of his time today trying to turn around the Charlotte Bobcats franchise. Even when he turns 96, I'll still see him as the high-flying, tongue-wagging, greatest basketball player to ever live. I see him the way older people view players like Julius Erving and Bill Russell. It'll be interesting to see where Jordan's life takes him now that his playing days are solidly behind him. That's the thing about being a professional athlete, you retire at such a young age compared to most people. I remember reading as a kid how Jordan would rank at the top of lists of the world's most recognizable people. I think he would only be behind a handful of people like the Pope, the U.S. president, and Michael Jackson. One of my friend's sister teaches first grade and she was talking about Jordan one day in class and none of the six year-olds knew who he was. I'm sure they will in a couple of years, but I'm also fairly certain that they know who Kobe Bryant is right now. The Bobcats play at Orlando tonight, then at home against Indiana tomorrow. Go show your support for MJ's team and he could very well be in attendance. Then, if you're lucky, you might spot him out at a nightclub later. I recently wrote a magazine article on the best night spots in Charlotte for celebrity sightings and Jordan's name popped up several times during my reporting.